The Kill Teams of 40k back in 4th edition were fun little skirmishes that added a neat dimension to the game. They allowed a player to have a small army that, while almost certainly not legal in a normal game, was fun to paint and collect. It was far more conducive to personalizing a model (such as giving him trophies, painting him differently than the rest of the army, etc.) and made the game seem just a little more personal as it is easier to project yourself onto one or two models rather than a whole army. A few years ago, shortly after 5th edition was released in fact, I decided, along with my longtime friend and fellow blogger Alex (he goes by Dictator), that we were going to revamp the Kill Team rules. Thus began a fun little project. I wrote up a basic set of rules, we played them, liked them and then published them in the first issue of The Astro Mag. I didn’t receive much response from them so I let them sit for awhile before, out of the blue, receiving a bunch of emails asking if I was planning on revamping the rules at all. This newfound interest got me excited, so I set out to redo them and turned to my Wargaming group at my college. We play tested them a few times, found holes, patched them up, and then published the new set in Issue 3 of The Astro Mag which received a lot more positive feedback. Fast forward a year later and here I am, again, looking to improve upon this little project I undertook. This time, however, I want to go big. I want to make a comprehensive rule-set (not too complicated though, I want a new player to be able to come in, read through the rules and get playing immediately with very few questions). However, there is a huge part that needs looking at and there's the potential loop-holes or problems with the rules. This is why I am turning to the From the Warp blogging community! I just need a few minutes of your time. I am asking that you take a few minutes to read over the rules, offer your opininons, suggestions, improvements, or even playtest them with a buddy (the games are quite short, but are very enjoyable!) and then email me at terranforge@gmail.com. Like I said, I’m looking for all your suggestions, improvements and ideas. If you think you've got a good idea that could be included, shoot it by me by email and let me know, I'm open to everything. Now, why would you want to play Kill Team let alone help out somebody you’ve never met revise some rules for them? Well, for one, I know many of us have friends who have looked at getting into the hobby, but find it too costly or time prohibitive to play. These Kill Team rules are a perfect remedy. You don’t need many points for them at all (directly resulting in saved money) and the games are quick. Alex and I have packed ten or so games into an hour, for example. The games require little space and just a basic understating of the 40k rules, but are guaranteed to be fun. 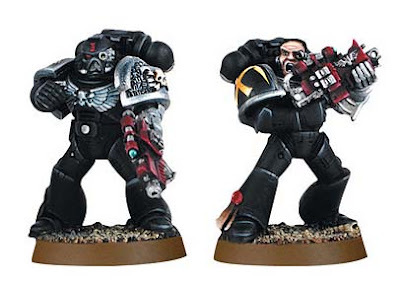 Not only that, but I've found myself wanting to paint up a mini especially for these Kill Team rules just so I could have a cool, fun looking force to play with when I’m hanging out with friends on the weekend. And that’s the other benefit, you need little to no planning for these games whatsoever. With a regular 40k game, you need to set aside at least two hours to play, you need to pack up your entire army, create a list and a host of other things which can add up and eat away at your free time. With Kill Team, all you really need are a handful of models and maybe 10-20 minutes of free-time and you got yourself a fun little game to play. Of course, as most of you probably know, Games Workshop released a great supplemental book called “Battle Missions” where rules for a Kill Team are already outlined. However, they are much different in their play style than the rules I have created (and, as I’ve already mentioned, intend to improve upon). The GW Battle Mission rules allow for a similar style of game (few units, quick gameplay) but the situations do not vary. If you take a look, the rules published in The Astro Mag have great variations on what can happen in the game and the environment plays a pretty big role as well. This idea, that of bringing environmental effects into gameplay, is a very interesting one for me and is why I included them in the rules to begin with. Instead of only having to worry whether or not your enemy can see you, you will also have to position yourself so the world you are in does not inflict any casualties on your army. I feel it brings a new level of tactical gameplay onto the battlefield and is just one small reason my Kill Team rules differ from the ones laid out in the Battle Missions book. That said, I would like to let you know that I will also be changing the name from “Kill Team” to something else and am entirely up for suggestions! Two that have come up already are “Fire Team” “Strike Force” so feel free to shoot me an email with suggestions on that as well! The benefit Kill Team has to 5th edition is that (at least here in the US) we’re all so used to playing at high points levels. 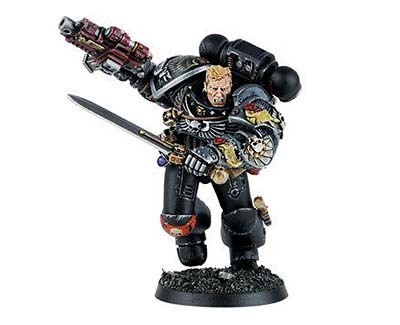 We are forced to think about the synergetic effects of one unit with another and never get to think about the awesomeness of a single marine storming a bunker with nothing but a bolter and a grenade. We never get to think about the heroic acts we so frequently read about in the compelling Black Library novels. Kill Team does just this. You get to have your heroes. You get to have your impossible situations that your lone squad is forced to overcome. It’s a far cry from what we’re all used to and is most definitely a nice relief from the constant thought of lists and unit synergy and what have you. Not to mention that this type of stuff, while written for the purpose of fun, can be a cool thing to have as a tournament. Because of the short (in time) nature of this game, you can have a number of rounds and a wide variety of scenarios where you will never face the same thing twice even if the armies are exactly the same. It’s almost RPGish, when it comes down to it. A beautiful little sub-ruleset that adds to allure of 40k. Now, it may not be much, but I will put the names and blog links (if applicable) to anyone who submits any suggestions or what have you in the Kill Team Rules. This will be posted as a standalone release and it will be published in a future Issue of The Astro Mag which sees about 8000-11000 downloads an issue so you’ll get a decent amount of exposure for your blog. Also, if you’re interested in sending in pictures of your models or artwork, just send me an email so when I start the rewrite I can email you back letting you know what I’ll need. Again, everything would be appropriately accredited. My email is terranforge@gmail.com and I hope I can get a few of you wonderful bloggers out there to help make this little project into a great, fun set of rules for all to enjoy! You can also follow the progress of this project at my blog, Terran Forge or on my twitter account. The current set of Kill Team rules can be downloaded here. Got a question or a comment, let me know about it by posting here. My LGS is doing a Kill Team tournament in a few months. We have a ton of new players and we're trying to make sure they have a chance to compete. I'll take a look over your rules and see what we can do with them.